grandma's cookie jar: The Atlas of Oddities - I'm Giving One Away! 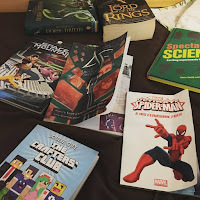 My eight-year old grandson loves to read. I mean, he really LOVES to read! A couple weeks ago his dad shared a photo on facebook of the books he found in his son’s bed . . . books he is reading. One of the books was The Lord of the Rings . . . yes, The Lord of the Rings!!! Yes, I said he is eight years old! This is why when I look for books to review with him in mind, I look for books which will capture his attention. Books which will challenge him to think. So, when I saw Sterling Children’s Books had a new book available titled; Atlas of Oddities, I thought it would interest my grandson . . . it definitely does! Today I’m happy to share this book with you – and announce a giveaway as well. Organized by location . . . where in the world, on which continent, you will find specific “oddities”. Illustration and a written description for each “oddity”. Encourages curiosity and imagination as well as learning. My eight-year old grandson is definitely enjoying the Atlas of Oddities! It is not the type of book you sit down and read straight through – there are way too many “oddities” to “absorb” reading them all at once, but he will sit down and spend 30 to 40 minutes reading . . . and laughing about the things he learns . . . then, of course, he shares them with us! The Atlas of Oddities is a fun book and is sure to amaze whoever reads it! I’m very happy to say, not only did Sterling Children’s Books send me one copy of the Atlas of Oddities for me to review, but they are making another available for me to give away (USA only). If you are over the age of 18 and would like to enter this drawing for the Atlas of Oddities - which will be on February 6, 2017, please comment below to tell me about something in this world which you think is “odd” . . . I’d have to say the Terracotta Army in China is pretty odd – and amazing! In addition if you have followed on Google Friend Connect, followed by liking on facebook with the tab in the "Find us on Facebook" box ON THE BLOG or at this link (not just liking the post) and/or have followed grandma's cookie jar by email you will receive one entry for each of these which you have done. Plus, if you "share" this post, you'll receive another entry (please let me know if you share). This will help me be able to draw names from among people who would like to win the Atlas of Oddities and it gives you several ways to enter the give-away! Thank you for reading grandma's cookie jar and for sharing it with the people you know! This sounds like such a cool book! I think one of earth's oddities is the deep sea fish that has a light sticking out from its head. I follow on Facebook, through my Feedly reader, and follow onGoogle +.